Semtech Corporation (Nasdaq: SMTC), a leading supplier of high performance analog and mixed-signal semiconductors and advanced algorithms, today announced immediate availability of its complete IC portfolio, ClearEdge® and FiberEdge™, optimized for optical transceivers serving 5G wireless applications. The unprecedented and strategic nature of 5G has come into sharp focus in recent months and 5G deployments are expected to accelerate throughout 2019. Apart from being faster and more reliable, 5G wireless networks are transforming how devices connect to the Internet and with each other. 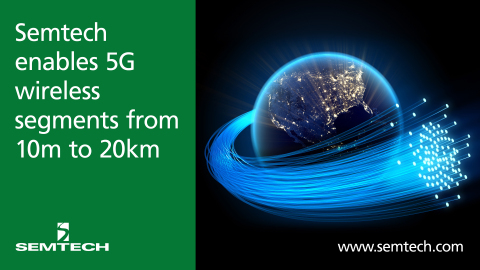 5G enables key markets such as virtual reality, autonomous vehicles, Internet of Things (IoT), and other applications requiring high throughput, massive network connectivity and ultra-low-latency for real-time operations. With higher amounts of mobile data, 5G wireless networks require higher speed wired interconnect. Key components of these wireline networks are optical transceiver modules capable of supporting industrial temperature range for distances starting from 10m to over 20km. Semtech helped launch flagship 5G deployments with its ClearEdge platform (GN2139C CDR) and is now delivering integrated PHY/PMD solutions. This technology enables module vendors to develop more fully optimized next gen optical transceivers. “We believe WDM will be an important segment for 5G in Korea and Japan, while Tunable and DML based modules will be critical for China market. Europe and North America will utilize existing wireless architecture that requires multi-mode fiber optical modules. We look forward to supporting our customers today and tomorrow with a highly differentiated IC portfolio,” said Dr. Timothy Vang, VP of Marketing and Applications for Semtech’s Signal Integrity Products Group. Semtech’s optical networking product platforms provide high-performance signal integrity for optical module solutions used by leading companies in the data center/enterprise networking, wireless infrastructure and passive optical network/Fiber to the X markets. For more information, visit https://www.semtech.com/products/signal-integrity. All statements contained herein that are not statements of historical fact, including statements that use the words “will,” “expected to,” “designed to,” or other similar words or expressions, that describe Semtech Corporation’s or its management’s future plans, objectives or goals are “forward-looking statements” and are made pursuant to the Safe-Harbor provisions of the Private Securities Litigation Reform Act of 1995, as amended. Such forward-looking statements involve known and unknown risks, uncertainties and other factors that could cause the actual results of Semtech Corporation to be materially different from the historical results and/or from any future results or outcomes expressed or implied by such forward-looking statements. Such factors are further addressed in Semtech Corporation’s annual and quarterly reports, and in other documents or reports, filed with the Securities and Exchange Commission (www.sec.gov) including, without limitation, information under the captions “Management’s Discussion and Analysis of Financial Condition and Results of Operations” and “Risk Factors.” Semtech Corporation assumes no obligation to update any forward-looking statements in order to reflect events or circumstances that may arise after the date of this release, except as required by law. Semtech, the Semtech logo and ClearEdge are registered trademarks or service marks, and FiberEdge is a trademark or service mark, of Semtech Corporation or its affiliates.